This booklet contains a collection of recipes for the most delicious items served at the Lake Cowichan Salmon and Mushroom Festival over the last decade. The first printing of this booklet by Ingeborg Woodsworth has completely sold out. It has been reprinted and is available once again . Use our “Contact Us” page to send an email message to Ingeborg expressing your interest in purchasing one or more copies of this booklet. 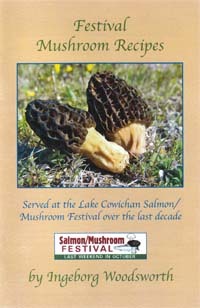 Purchase one of these booklets written by Ingeborg Woodsworth for the 2011 Salmon and Mushroom Festival. Use our "Workshops” page for the schedule of our Workshops. Learn about items served at the Lake Cowichan Salmon and Mushroom Festival over the last decade. Visit our "Booklet" page. Use our "Location” page for a map and directions to find us.